I hadn’t been to Singapore in over 10 years, but when I found a too-good-to-be-true cheap flights from Australia to Singapore, I figured it was time for a return visit. It also was the perfect trip to take my middle son on a solo mom-son trip. You can read all about how the trip came to be in this post. As a budget traveler, I was nervous about controlling costs in cosmopolitan Singapore. I remember visiting as a backpacker and watching our per day budget spin out of control. While there are lots of wonderful and costly attractions in Singapore, there are lots of free and low cost activities as well. Singapore really is a perfect destination for families because it offers an exotic cultural experience while also offering loads of kid-friendly attractions and activities. Here is our list of the top 15 things to do in Singapore with kids. For attractions, we found that we could save money by booking in advance with Klook. The added benefit was that we also could just walk into the attractions and didn’t have to wait to buy tickets. Sentosa is one big pleasure island and there are way too many things to do on the island to list. Have a look on the Sentosa website and pick a few things to do on the island. Depending on what you want to do, the Sentosa Fun Pass might be a good value, but it really depends on the attractions you choose. You could spend weeks exploring all that Singapore has to offer. We had 5 full days in the city, which was a perfect amount of time to see most of what we wanted to see. We spent 2.5 of those days on Sentosa. The iconic skytrees and Gardens by the Bay park did not exist last time I was in Singapore and since it has become an icon of the city, it was definitely somewhere we needed to visit. It is definitely one of the most Instagrammable places in Singapore for a good reason. I actually recommend visiting twice, once in the day and once in the evening for a very different experience. These vertical gardens are just as interesting up close as they are towering up out of the green space. Best of all, visiting the Supertree Grove is totally free! Check out these other fun and free things to do in Singapore. While most of us are drawn to the Supertree Grove, the whole 101 hectares of reclaimed land is a beautiful place to explore. On our day time visit, we did the Sky Walk ($8/adults, $5/child), a suspended walkway connecting the trees. It gave us an entirely different perspective of these living structures. Seeing the skytrees all lit up in the evening is another not-to-be-missed sight. The Garden Rhapsody Light Show occurs each evening at 7:45 and 8:45. It draws large crowds, but it is pretty magical to lay down and watch the spectacular light show. When we were there in November, they had just started their Christmas show and it definitely got us in the Christmas spirit. The Cloud Forest and Flower Dome observatories are at an additional cost and are spectacular. The Far East Organization Children’s Garden with water play and educational activities will be a huge hit with kids of all ages. For a touristy, but good meal while there, check out Satay by the Bay, a hawker area where the signature dish is…satay of course. Singapore’s Night Safari is a really unique way to observe wildlife and is one of our top things to do in Singapore with kids. Since Night Safari doesn’t get started until after dark, it can be a challenge for young kids. I would recommend Night Safari for kids over 5 due to the late start and night can be a bit scary for younger ones. This is an incredibly busy attractions with lots of tour groups, so you will want to book your tickets in advance. We arrived at 7pm and watched the Thumbuakar Fire Dance Show, which was a huge hit with my son. They spun fire, they flew fire, all while dancing. The first Creatures of the Night interactive nocturnal show is at 7:30 and is the best one with kids. We thought the host was really excellent and we learned a lot in this 20 minute show. The main event is the 45 minute tram tour through the Night Safari habitats with commentary. It is really different to see many of these animals at night. After the tram tour, you can also explore some of the walking trails, although my kid was much too tired for that. Night Safari is a must for animal-loving families and a very unique wildlife experience. Read this post to learn more about the Singapore Night Safari. 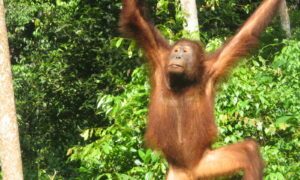 Getting there: Night Safari and Singapore Zoo are both away from the city centre. Take a Taxi! We tried to take public transit there and we would definitely recommend a taxi from the city. We had fond memories of doing the luge in Queenstown, New Zealand and this was one of the activities my son was most interested in. This is actually two activities in one because you get to take the Skyride chairlift up the hill with beautiful views out to sea and you get to luge down four different tracks. My 8 year old son had no problem operating his own luge. They are very good at making sure you understand how to brake and steer before they set you free down the hill. I would definitely recommend buying a package that allows multiple rides as there is no way the kids will be satisfied with just one run down. The great thing about the Skyline Luge is that you can do a few rides down in less then an hour, making it a fairly quick activity. This was also one of my son’s favourite activities of the whole trip and a great thing to do with kids in Singapore. Getting there: Taxi or MRT to Harbourfront, then take Sentosa Express monorail across to the island. While it is easy to get sucked into every attraction in Singapore, one of my favourite things to do is to wander through the distinctive neighborhoods of Singapore and soak in the culture. Adults and kids will be fascinated by the colours and action of Little India. Most guidebooks have walking tours through Little India where you can take in the sari and gold shops, dance to Bollywood tunes and sample the cheap and tasty Indian foods. We picked up some bangles and henna and the shopkeeper couldn’t help giving Gavin a souvenir. When I found out there was a KidZania in Singapore, I knew we would have to visit. We first experienced a KidZania in Bangkok last year and all three kids loved the experience. If you aren’t familiar, KidZania indoor theme parks, are an attraction like no other. It is an interactive mini-city for kids where they role-play various careers, manage money and learn about different jobs. Kids choose and participate in 20-30 minute role plays throughout their visit where they earn money for doing jobs or pay money for goods and services. They might test milk for bacteria, participate in a crime scene investigation or make and eat their own burger. There are so many different careers and businesses to suit any interest. Our daughter loved being a new reporter and fashion model and Gavin enjoyed being a firefighter and working at the vault delivering money to the nearby businesses. Visit on a weekday when it is less busy. There are often school groups in, but they generally leave by 3pm, making the late afternoon much quieter. KidZania is best for kids 4-12. KidZania encourages kids to be independent and parents cannot participate in the role plays (you can take photos and observe). Parents may want to bring something to do. There is a parents room to use, but I enjoyed watching Gavin participate in the activities. For further information, read my friend Sally’s thorough post on KidZania Singapore. You can’t come to Singapore and not indulge in its world famous hawker food. While they may not look as sanitized as Western restaurants, Singapore’s hawker centres are completely safe, cheap and an interesting way to dine. The great thing about Singapore is that you don’t have to look hard to find a hawker centre with them embedded in every community and shopping centre. Some that are used to tourists and good ones to start with are Gluttons Bay (on Marina Bay), Satay by the Bay (Gardens by the Bay), and Chinatown’s Maxwell Food Centre. Our kids’ favourite dishes are: roti, satay, kway teow, wan tan mee, and Hainanese chicken rice. They particularly love ice kachang where somehow sugary fruit and ice comes together with corn kernels and red beans. Universal Studios is the anchor of Sentosa and while it is a fairly compact theme park, it offers up an easy and fun day with kids. We recommend buying discounted tickets in advance at Klook and aiming to visit mid-week when the crowds are much less. Our Wednesday visit in November was very quiet and we never waited more then 20 minutes for a ride. Visiting with my 8 year old son was perfect as he was brave enough to ride all of the rides. There are lots of things for younger kids to do as well from rides to shows to character visits. Although my son loved the rides, his favourite thing was the Waterworld Stunt Show, which he enjoyed so much we went to twice. There are so many great family attractions in Singapore, but USS is one of the best. Located right near Little India, Kampong Glam is another neighborhood worth a wander. Also called Arab Street, the colourful streets, trendy shops and impressive Sultan Mosque will have you thinking you are in the Middle East. Kids will enjoy the colourful street art and souvenir shopping. Singapore is a pretty hot and humid place any time of the year and a visit to a water park is a great way to cool down. Adventure Cove on Singapore is a mid-size water park that you can experience easily in half a day. There are the usual tube slides and wave pool, but Rainbow Reef provides a unique opportunity to snorkel in a giant salt water aquarium and see thousands of tropical fish. Other fun activities are the wet maze and high ropes course and Splashworks where you can rock climb over water, climb the cargo net and more daring pursuits. For younger kids, the Big Bucket Treehouse is a fun and safe playground with gentle slides and lots of shooting water. The lazy river is even more exciting since it goes through a sting ray and shark aquarium. This was one of our fav things to do in Singapore for kids. Purchase your discounted tickets at Klook before you arrive. I remember visiting the Singapore Zoo years ago and being so impressed with the natural enclosures that they helped pioneer. The Zoo sits on a massive green space, far from the busy city-centre. The Night Safari and River Safari and soon the Jurong Bird Park are all neighbors and easy to access from each other. The lush grounds make it a peaceful place to observe the wildlife and we recommend spending at least 3 hours visiting. If traveling with young kids, bring a pram as the Zoo is very spread out and it is hot. My son really enjoyed the white tigers and learning about tiger conservation. The Fragile Forest Biodome was a great way to get up close to the free-roaming birds, lemurs and sloths. We arrived at the Zoo at 2pm and spent a few hours exploring, before heading over to the Night Safari. There are more dinner options available at Night Safari, although we couldn’t miss the Ben & Jerry’s at the Zoo. The last of the neighborhoods that you have to visit on a trip to Singapore, Chinatown’s heritage buildings, great foods and rich culture are a great place to wander. Again we mostly followed our guidebook’s walking tours, but wandered wherever our interests took us. The Sri Mariamman Temple and Siang Cho Keong Temple are both interesting stops and the Maxwell Food Centre is a great place to sample hawker fare. The iconic and beautiful Marina Bay Sands Hotel is beautiful any time of day. If you are brave, you can wander through the Marina Bay shops. Seeing it lit up at night is definitely a top thing to do in Singapore. The Spectra Light & Water Show is a free to the public show that happens each evening at 8 and 9pm. You can watch up close from the Marina Bay Sands Hotel side or you can watch across the Bay near the Esplanade. We timed it perfectly and got great seats at the Gluttons Bay hawker centre where we watched the colourful show. Sadly, the only way to enjoy the famous infinity pool at the Marina Bay Sands hotel is by being a hotel guest. Read this post (48 Hours in Singapore) to hear all about a stay at this renowned hotel. Singapore’s Changi Airport is generally accepted as the best airport in the world and we were blown away by the beauty of the airport and amount of things to do there. Don’t rush out of the airport; arrive early and experience this world-class airport. From the orchid gardens and green living walls to the free movie theatre, WIFI and video games, Changi knows how to appeal to all travelers young and old. The kids loved the free candies available at every desk in the airport, including the friendly customs officers. With children’s playgrounds, a swimming pool and more, this airport set the bar really high. Back when I visited Singapore years ago, the Merlion, the Quays and Colonial District were the main attractions. Although they have been slightly eclipsed by Marina Bay Sands and Gardens by the Bay, no visit to Singapore is complete without visiting the towering Merlion statue shooting water into the Bay. Go early to avoid the massive crowds that accumulate here, take your obligatory photo catching the Merlion’s spit and then retreat. Enjoy a more peaceful walk down the Esplanade and across the Helix Bridge to the Marina Bay Sands. This is a great opportunity to enjoy the beautiful Bay and city skyline. In my family shopping and kids don’t go hand in hand, but Singapore’s Orchard Road shopping precinct is worth checking out. This an be a great place to go when the kids have tired of the heat as all of the malls offer indoor playgrounds and movie theaters. Marina Bay Sands – if budget isn’t an issue, this would be the place to stay! Only hotel guests can access the incredible rooftop infinity pool and families are catered for in the club and family rooms. Click here to check the latest prices. Resorts World Sentosa Festive Hotel – if you fancy staying on Sentosa, the kids will love these themed rooms. Click here to check the latest prices. Village Hotel Bugis – a good mid-range hotel that caters to families in Kampong Glam. Kids will like the themed rooms and pool and parents will appreciate the convenient locations. Click here to check the latest prices. Fragrance Hotels – this chain of budget hotels offers family rooms for under $100/night. With locations throughout the city this is your best bet for cost-conscious families. Click here to check the latest prices. While Singapore is fairly compact, you will need to take taxis or public transit to get to many of the attractions and neighborhoods. We were staying in Little India and used the MRT most of the time to get around. We picked up an Ez-Link card, so we could avoid the hassle of buying tickets for each journey. There is a non-refundable deposit of $6, so I would only do that if you are going to be in the City for a few days. Public transit is very inexpensive and efficient. We also discovered the double-decker buses and my son loved sitting in the front row up top where you had a great view. We also found that taxis were really inexpensive and often provided a much quicker and direct route to where we wanted to go. Next time and if we were traveling with the whole family, I would definitely use taxis more. Thanks Nicky. Those were some of our fav places as well! It was cool to go back and reminisce about our backpacker days! And of course it totally made me miss living in Malaysia…that humidity, the food…ah! Hope you get there Leona:) Marina Bay Sands and Gardens by the Bay are both so unique and interesting. Singapore really does offer so much! we plan to go there in a couple of years. I need to keep this blog bookmarked until then! Looks AMAZING! Awesome! Try to spend at least a few days there as there is so much to do and it is a great place to relax and enjoy nature. 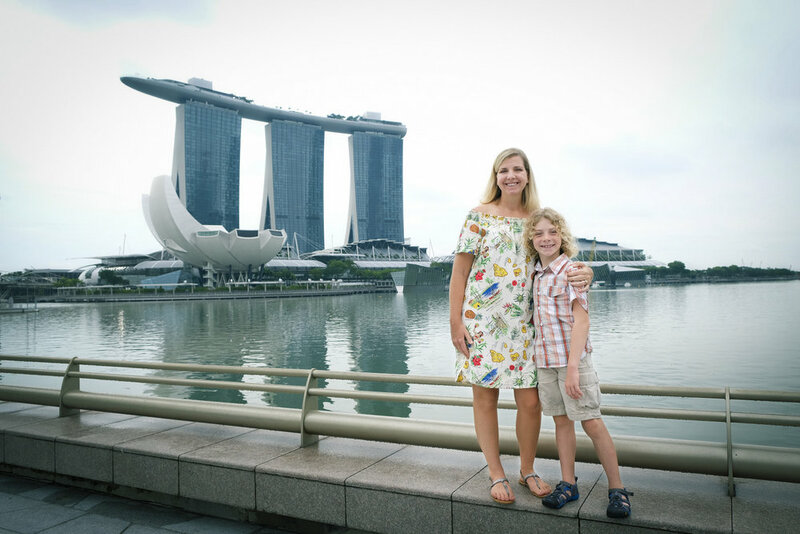 My kids love Singapore – so much to do. I’d also recommend hiring a bike and riding around Palau Ubin and the Haw Par Villa Gardens. The museum at Bukit Timah is good too. So funny that you mention that Lydia! We actually took transit out to the Palau Ubin jetty (which took forever!) and we got there around 2pm and it was pouring buckets and they said we would have to pay for a whole boat if we wanted to go across. It was one of those travel fail experiences and I was so devastated cause I have heard such good things about Palau Ubin. Oh well, something for next time! I didn’t realize there was such a wide range of activities in Singapore. I think my kids would love everything on your list. It’s cool that you can snorkel in the aquarium at Adventure Cove Waterpark. This is the first time I’ve heard of KidZania. My teenager might not like it, but I think my 10 year old would enjoy the experience. This is just the tip of the iceberg in Singapore….so many great things to do with kids. KidZania is a super cool concept and great for a 10 year old.